Suitable for porous stone & terracotta. 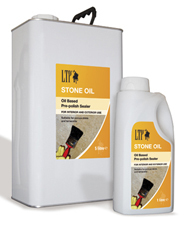 Easy to apply oil based impregnating sealer ideal for low porosity stone & terracotta. Enhances the colour and texture of floors. Offers good mechanical strength once cured. Leave for a minimum of 24 hours to fully cure before finishing with LTP Ironwax satin or LTP Ironwax Gloss. If using this product outside, the surface should be finished with a coat of LTP Mattstone sealer to offer extra protection. Routine cleans with LTP Floorshine. Manufacturers instructions must be followed, used cloths should be burned after use.